The Relative Strength Index was introduced to the wider trading community in 1978 by J. Welles Wilder. Wilder first published information regarding the Relative Strength Index in the June edition of Commodities magazine before going onto cover the indicator in more detail in his 1978 book, New Concepts In Technical Trading. The Relative Strength Index is an oscillator designed to track the momentum of price movement. The oscillator fluctuates between a 0-100 range, with the Index tracking recent close prices in relation to the current price and therefore is used as a measure of velocity. 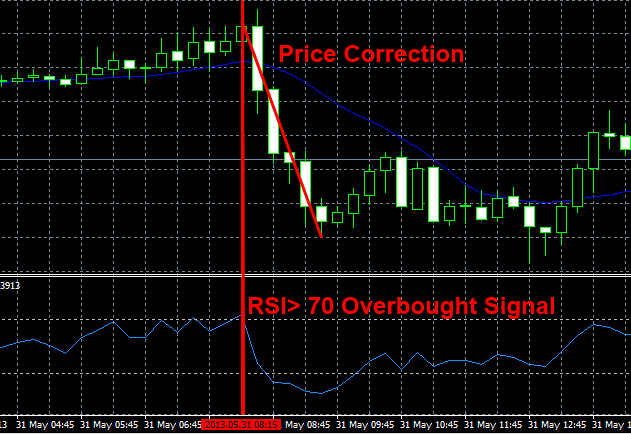 The RSI is a front weighted momentum indicator which measures an instruments price relative to it’s past performance. This front weighted nature of the indicator has led many to conclude that the RSI works as a better velocity indicator than a lot of its competitors. Due to the way the RSI is calculated, it is less effected by sharp rises or falls in the price of a particular instrument. It has therefore been contended that the Relative Strength Index filters out a lot of white noise. Thus many have opted to use the indicator alongside Bollinger bands. The U stands for the average of Up closes. While the D stands for the average of Down closes. Secondly, you would add the closing values for down days together and again divide this total by 14. Now you divide the up-day average by the down-day average. This gives you what is called the RS (Relative Strength) factor of the formula. Simply add +1 to this RS value. Divide the number reached in step 4 by 100. Finally, subtract the number from Step 5 from 100. Wilder originally proposed the use of a 14-day RSI, but in his later works he introduced both a 9-day and 25-day RSI. Many Forex traders may use a shorter term RSI than originally proposed by Wilder depending on their particular trading strategy. Thankfully the vast majority of trading platforms and charting software’s should automatically calculate RSI for you, giving you no need to painstakingly calculate the RSI for yourself. However knowing the formula helps a trader understand how the indicator functions. RSI values are always within 1-100 range, and traditionally buy signals have be triggered at 30 while sell signals have been triggered at 70. But their has been a slight shift away from this traditional interpretation in the last couple of decades, with many technical analysts now using 20 as a buy signal and 80 as a sell signal. The RSI is often used alongside resistance and support studies, including trend line penetration and price patterns. The ability to show that an instrument is overbought or oversold is meant to be one of the main advantages of using the RSI. However, one has to be careful when using the RSI as overbought and oversold indicators tend to do poorly when an instrument is trending on particular direction. Overbought: An overbought signal suggests that the instrument has been trending upwards but their are signs that the trend may be coming to an end. Eventually the position becomes saturated and individuals start taking their profits, theoretically this can often lead to a change in the general trend or at least a mild correction. Oversold: An Oversold signal suggests that the instrument has been trending downwards but their are signs that the trend may be coming to an end. An oversold signal suggests that the sell off is slowly down or that speculators believe the instrument has been sold off to strongly meaning that the instrument is now undervalued. This again may signal the start of new trend or alternatively a slight price correction. Due to the general unreliability of overbought and oversold indicators, it is common to find traders using the indicator in conjunction with several other signals. Though I would say that the Relative Strength Index is one of the better tools that a trader can have in their kit bag.